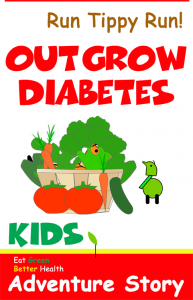 Diabetes books and stories are good to help establish morals and a stronger sense of self. The sooner you get started reading to your kids, the quicker the transformation begins. Learn More… Health Book for Kids. The Run Tippy Run – Draw Me Healthy is an adventurous health related story written for young children. While the story is upbeat and written to put young children in a good mood, make them laugh and educational, the content will discretely make kids more aware of their eating habits. A good adventurous children’s book is written specifically for kids with the purpose to help prevent kids from contracting diabetes. Without actually using the word “diabetes.” the book employs a velvet-glove and humorous approach in presenting otherwise serious topic material. However, the content cleverly illustrates a direct link between food choices and sources. We are trying to prevent diabetes in children. 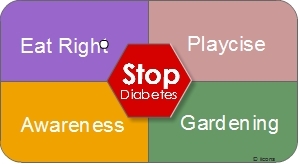 Read more here… can stories prevent diabetes? It would be in your best interest to introduce a high vegetable intake diet into the lives of everyone dear to you. Vegetables are slow release carbohydrates, eating lots of them in place of high sugar content food help to provide needed glucose (energy) while preventing high blood sugar spikes. Good stories help develop good minds and combat TV commercials. The child’s personality is cast in stone between the ages of 1-10 years old. During this critical period, your child is being bombarded with 100,000 30 second TV commercial stories on television and the internet. Stories can shape opinion, motivations, guide decisions, and help a child maintain a positive esteem of themselves. A good story can be the beginning of better decisions. Decisions can lead to better food choices. Choices that benefit health NOT just taste. 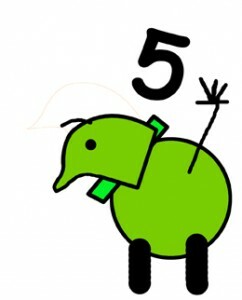 The main character of Run Tippy Run is an opportunity to read an adventure story that is child centered. TV commercials are the medium that is most commonly used to help spread diabetes coast to coast by encouraging overeating and bad food choices. Diabetes Awareness is 24-7 for all of us. Children stories is a starting point to help prevent diabetes in kids. Eat and move, eat and move, eat-move, eat-walk. Your kids health is at stake, but their health can be protected by keep moving. Run like Tippy. Run from fast foods, run from commercial foods, run for kids health sake. This series of children books will attempt to introduce a green diet concept to young children making them aware of the direct relationship between their food choices and food sources. The book will also emphasize the importance of organic (chemical free) food. Latest research confirms a direct link between cow’s milk and Type 1 diabetes. This research is not false hope, but may provide genuine hope to PREVENT diabetes in kids! 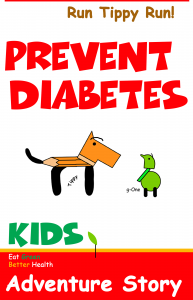 This Prevent Diabetes Kids Health Book will attempt to introduce a green diet concept to young kids. By illustrating a direct link to food and health, that will induce kids to question their fast-food diet choices & local food sources. The book seeks to call Type 2 Diabetes self-awareness into action and prevent the further spread of diabetes with the introduction of this diabetes kids health book. But, be diligent and seek out and consult with a well experienced, top in their field, cutting edge, qualified, informed, diabetic physician or herbalists who specialize in the latest research and clinical trial data about Type 1 and Type 2 diabetes. Otherwise, you and your family can spend years receiving outdated medical advice, and totally miss the most recent advancements in diabetic science breakthroughs. Leave your name and email to receive advanced book release notices. After signup, you will be directed to download links. Don’t forget to write an Amazon book review Go Here! In 2010, Ike had a brief scare with Type-1 diabetes. Afterward, this medical episode led him to conducted extensive research on the rise of Type 2 disease in our youth. Conclusive studies confirm a direct relationship between excessive sitting, HFCS, white sugar, fast foods, lack of awareness, the importance of green intake of organic foods. Ike is on a mission to provide a counter solution by focusing on the root cause of Type 1 and Type 2 diabetes. Ike is an Instructional Designer ISD, eLearning Developer by profession—30 years in corporate. The role of an ISD is to define clearly gaps or problems. Once “gaps” are defined, then methods are designed to close the gaps.